Click here to view our fishing galleries. 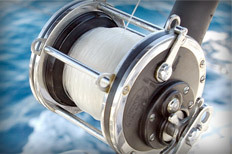 Click here to book your deep sea or gulf stream fishing charter. 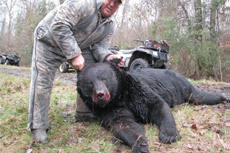 Learn More about Guided Black Bear Hunt. Captain Brynner Parks has over 25 years of fishing experience out of Oregon Inlet Fishing Center. With the warm water currents of the Gulf Stream meandering near the coastline of the North Carolina coast, you are only a short boat ride away to a wide variety of fishing species. 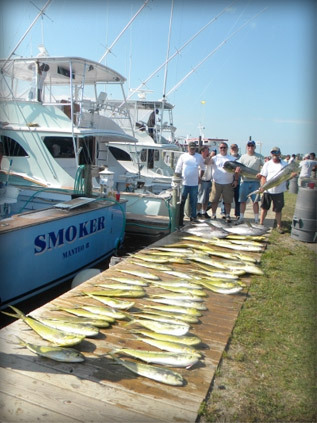 Whether you are an experienced angler in search of a catch and release blue marlin or you are a novice first-time gulf stream fisherman just looking to fill up your freezer, with the catch of the day, then the Smoker is the right charter fishing boat for you! The Smoker is a 58 foot Carolina Custom boat built by Irvin Forbes. It has three fighting chairs in her cockpit and a tackle locker that boasts spinning rods, stand up gear, bailing rods, and heavy 80-130 class rods and reels. 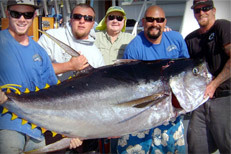 You and your group will experience a charter fishing trip unlike any other. You never know what you might see or catch on your next charter fishing trip. Give Brynner a call today or you can book your next deep sea charter fishing trip. 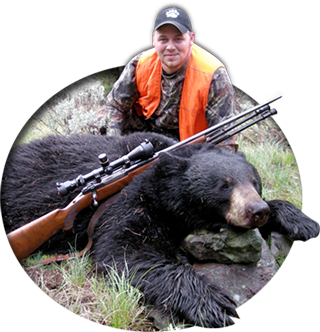 If you are a big game hunter, then check out Brynner's guided black bear hunting trips in November and December!